As a teacher leader who travels the country working with schools to improve their culture, I’m constantly amazed at the varying degrees to which staff members respect, encourage and communicate with each other. Here’s what I’ve concluded: the number one factor that determines whether a school culture is toxic or thrives is how staff members deal with their own conflicts as they arise. As teachers, part of our job is to help students learn to get along. As teacher leaders, we must be able to address our own inevitable conflicts in a positive, respectful manner. This can make or break our school culture. So, How Can We Handle Conflict Effectively? at least three perspectives: yours, your colleague’s, and the students’. Whatever the situation you need to confront, this will help you see the situation more fully, and begin to pinpoint exactly what the issues are. Step 2: Confirm behavior privately. Often, we wonder if a colleague’s behavior is bothering others, or if it’s just us. It’s OK to privately ask another colleague for perspective—in a professional, upbeat manner, focusing on specific behavior and how it affects the group. Step 3: Make an appointment. When you’re ready to approach the person, it’s important that this conversation takes place in a comfortable, private location, with plenty of time. Catching someone off guard is not only unfair, it can also block the ability to have a relaxed and real exchange. Sometimes, knowing how to begin the conversation is the hardest part. Rehearsing a clear opening is key to whether the conversation becomes productive, or gets derailed before it even begins. Avoid making general, “blanket” statements about an issue. Rather, use specific examples, such as, “You arrived 12-14 minutes late to our past three Tuesday meetings.” Only when we are willing to confront someone with specifics can the specific behavior be addressed and improved. In addition, it’s imperative to separate behavior from self-worth. Telling someone he came to the meeting late (behavior) is far more productive than telling him he never gets anywhere on time (self-worth). It’s OK to laugh, cry, or admit to being confused. It’s also OK if the conversation goes silent for a few moments. By bringing our authentic selves into a conversation, we’re able to lean into a conflict, instead of shying away from it. Being real also means truly being open to the other person’s perspective. Thus, after you’ve opened the conversation with specifics, your main job is to listen. Step 7: Make a plan. Conclude the conversation by agreeing on a plan of action, including how you’ll hold each other accountable. Too often, great meetings end with everyone feeling better, but no plan in place. This often leads to the problem occurring again. Simply saying, “So, what’s the plan?” will move the conversation toward implementable, sustainable solutions. Then, follow up. When it comes to the success of an individual classroom, nothing is more important than the relationship between the teacher and the students. When it comes to the success of an entire school, nothing is more important than the relationship of the adults in the building. Conflicts happen when human beings work together. How we deal with those conflicts is where we have the power to truly shape our school’s culture. 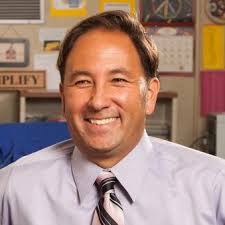 Alex Kajitani is the 2009 California Teacher of the Year, and the author of the acclaimed book Owning It: Proven Strategies for Success in ALL of Your Roles as a Teacher Today.